National Margarita Day Feb 22Continuing with the critiques I started in 2015, here is the next in series – a book review. Review of all books in this series: Go here. Recommendation: Definite pick for this book. A beginning of a great series. This is the first book in the series titled "The Secrets of the Immortal Nicholas Flamel" written by Irish author Michael Scott and published in 2007. I picked this book for its cover - with all the symbols and scrolls - it intrigued me enough to go for it. And I ended up reading the entire series as well. :) The books are primarily based on Nicholas "Nick" Flamel, a 14th century French scribe and manuscript-seller and his wife Perenelle "Perry" Flamel, who commission religious sculptures among her other charities. Both were famous posthumously, primarily around the 17th century for being alchemists and their search for Philosopher's Stone and Immortality - many of the rumors being false. Scott was smart enough to bank on that rumor into a six-book fantasy novel. In the process he immortalized not only Perenelle and Nicholas but many other legendary and some mythological (Irish, Greek, Egyptian and even Biblical) characters in these books. 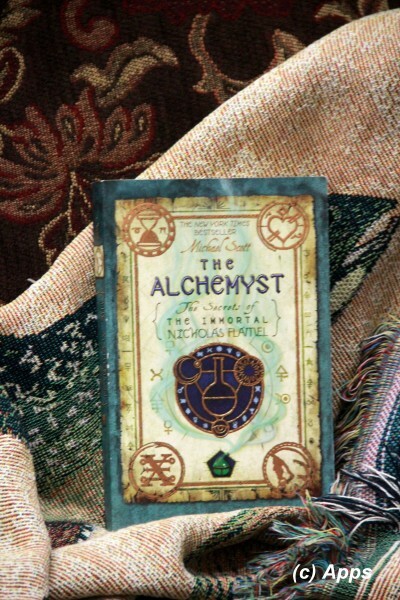 Here is my take on the first book titled aptly as "The Alchemyst" - obviously referring to Nicholas Flamel. It wasn’t any normal day for Sophie and Josh Newman, 15 year old twins, working at their summer jobs. Josh works at The Small Book Shop owned by Nick and Perry. Sophie works across the street to the book store in The Coffee Cup. Why isn't it a normal day then? Well, first of all they come to know that Nick and Perry are no ordinary humans, but famed immortals Nicholas and Perenelle Flamel, living an anonymous life in the city of San Francisco. They have been in possession of a book, The Codex - or The Book of Abraham the Mage - which has the secret that is keeping him and Perry alive for 700 years. Dr. John Dee (based on the legendary John Dee who was a 16th century English Mathematician, Astronomer, Astrologer, Philosopher, advisor to Queen Elizabeth I and also an alchemist himself) comes in search of the book to The Small Book Shop. In a stand-off between Nick and Dee, Josh ends up clutching the last two pages of the book while Dee escapes with the book, after destroying the book store along with Perry. Dee however would need the last two pages which are critical for his ultimate goal and pursues them. Thus begins the adventure of Sophie and Josh landing them in the middle of the greatest legends of all the time. In their journey they get to meet some of the powerful people known through centuries - Scathach, from Irish mythology a Scottish Warrior Woman commonly known as The Shadow or Warrior Maid or a Vampire; Hekate, a Greek Goddess often depicted in triple form (maiden in the morning, matron in the afternoon and crone in the evening); Hekate's Shadowrealm; Yggdrasil, mythical tree connecting the nine worlds in Norse Cosmology (In the book it is depicted that the life and power of Hekate is linked to Yggdrasil); Bastet, Egyptian Goddess of Cats; Morrigan, Irish Goddess of battle primarily taking the form of a Crow; The Witch of Endor, a Biblical Hebrew or Medium and the famed Excalibur, legendary Sword of King Arthur. Twins come to know that they are both born with magical potential that need to be unlocked so they can fight Dee and whatever his final agenda is. Now that their identities are revealed Dee wants to get hold of them as well. Some of these legends aid the twins and Nick, while some work against them in consort with Dee to capture the twins and the missing pages. Thus continues the journey that brings out the best and worst in all of them - courage, goodness, jealousy, anger, bitterness, separation and above all will to fight everything and come out winning. They have to not only stop Dee for using the Codex for his ulterior goal but also get the book back so they can rescue Perry and save both of them, for without the book Nick cannot create the formula to stay alive. The book ends with Nick, the Twins and Scathach travel to Paris for LA through Leygates while Perenelle is imprisoned in the abandoned Alcatraz guarded by The Sphinx, alive. Certainly promising another adventure in the next book.